In order to maintain a proper standard of living, having a good job is very important. Many individuals are very confused about whether they are making the right choice when they leave a job. They think that they should only leave the job when they have already managed to get another one. However, under some special circumstances, it is alright to quit your job without another job at hand. Given here are some of the cases times when you are permitted to quitting a job without another one. When you decide or want to quit your job, rather than taking into consideration what everyone around you has to say just analyze the situation as you think best and then act accordingly. When to Quit your Job? When taking any choice of career, it is very important that you think and ponders carefully before you rush into anything. One wrong move could really negatively affect your career. However, if you have noticed over time that the company is very corrupt and is involved in a lot of illegal activity then it is better that you quit the job as soon as you possibly can. Companies which indulge in activities like this, usually end up in a legal mess soon or later. If you are someone who is both bold as well as courageous then you can go ahead and complain to the police about the activities which are going on. After working in the company for a considerable period of time you are bound to be aware of how the company is going in terms of profit which it is able to generate. If you notice over time that the company is suffering several losses and is even going into debt then it is perfectly alright for you to quit a job without another one in hand. This having been said, all companies go through a dry phase at some point of time or the other, however, if the employees continue to try their best at all odds, the company is sure to pick up. Do not simply give up the job the moment you realize the company is not doing too well. When working hard for a company all of us expect a salary at the end of the month. However, if you find that the company you work for is very irregular with its payment of salary then it is perfectly fine to hand in your resignation without another job at hand. A company which respects its employees will always pay them on the exact date which has been decided upon. It is terribly unprofessional when you are fully aware of the fact that the company is doing really well, but they simply refuse to pay their workers on time. If such is the case you should not stand for treatment like this at any cost. Any company which values their employees will always ensure that the employees never feel like they are being underpaid at any cost. There are many companies which go out of their way in order to give their employees perks and incentives just to keep them happy and dedicated in their service to the establishment. If at any point in time you feel like you are not being given your dues in terms of the salary you receive, you should just decide to quit your job without another job at hand. Money is very important nowadays and no one should be feeling ripped off. If you are someone who feels that no one in the company gives you the respect which is due to you and everyone treats you as a joke, then it is alright to quit your job even before you manage to bag another one. In the workplace, it is vital that everyone feels heard and valued. Even if you are someone who is not very old, that does not mean that people should treat you in any way they want to. The moment you stand up for yourself and take a bold step, people are bound to take you seriously and respect the fact that you too are someone who is a skilled professional. Along with wanting to receive a good salary for the services which are provided, everyone looks forward to getting a promotion especially if they have been working well over a consistent period of time. Being overlooked when it comes to a promotion, once or twice is alright. Yet if you notice that you are constantly being overlooked, then it is very important that you do not take this lying down. Once you notice that favoritism is something which is very much prevalent in your place of work, you should not hesitate before resigning without another job. It would be a terrible idea to leave a job if you knew for a fact that this is your dream job and that it is unlikely that you will be able to bag such a good job in the time to come. However if after pondering over the situation for a considerable period of time if you find that something better is bound to come along then you do have the liberty of quitting your job. There is no point in clinging to a job which you know that you are overqualified for. In the course of your career, one of the worst things which you can do is ‘settle’ for a job which you know is not ideal for you and your capabilities. What many people are unaware of is that often in the workplace there are many people who are abused and even harassed almost on a daily basis. If you are someone who is being subject to abuse or harassment in any form or degree, you should certainly quit the job at the earliest without even thinking about the fact that you do not have another job in hand. In addition to this, you should make it a point to file complaints in regard to the problems which you have been facing. Even if the person harassing you was someone powerful as the boss, you should make it a point to raise your voice in protest. In today’s times, stress is something which all of us have to deal with in some degree or the other. From a very young age, we should try our best to learn to deal with stressful situations so that in the workplace we do not crumble under pressure but are able to handle every situation head-on. However, if you think that things in the office had become too stressful and you are unable to maintain a proper work-life balance then you should seriously consider quitting your job without another job to join. No matter how successful you want to be, having a healthy practice life balance is very important. If you are someone who is passionate about your job then every day you will look forward to going to the office and taking up new projects which happen to come your way. Those people who are lacking in passion in regard to their job are often very sad, discontent as well as depressed. If you find that you are someone who is not passionate about the job you have then you should think about to leave or quit your job as soon as you can even if you have no other jobs offer before you. In life, you must do only what makes you happy. There is no need to follow someone else’s dream for you, you must make goals for yourself. Many people in the business world have the dream of starting their own company, but they never really take out the time to make this dream into a reality. 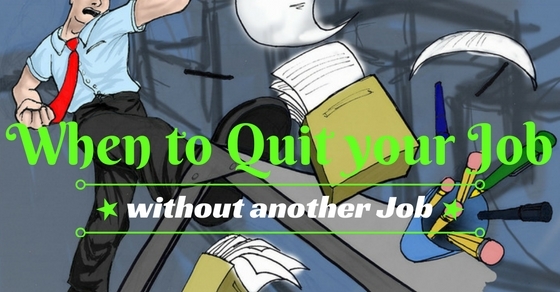 It is perfectly alright to quit your job without another job in hand because this will give you the push you need in order to start your own company. Things are certainly going to be hard at first. Yet if you have the drive, ability and even the experience things are bound to fall into place. If you simply move on from one job to the next without thinking about your own plans, you will never get down to working towards what you want. If you find that your job is really weighing you down, then you should most certainly quit your job. Rather than being sad about not having another job at hand, you should use this time to take a break, go on vacation and reconnect with yourself. If you think that you would like to go on a vacation with your family members then you should go ahead and do that. Making money is very important. But making memories with your family is something which is equally important as well. If you wish to excel in the business world it is vital that you work in a proper working environment. If the work environment in your office is very bad then you should consider resigning without a job or quitting your job, even if you do not have another job offer to fall back on. A negative work environment is something which is very bad for you and may affect you in a number of ways, whether it is physically or even mentally. Workplace politics is something which can be very bad for some companies and might take a toll on those employees who are soft-hearted and very meek. During the busy office hours, many individuals travel various distances to reach their place of work. If you think that you spend way too much of your precious time as well as money traveling to and fro from work then maybe it is time that you hand in your resignation, even if you do not have another job. Different offices have different work hours, however, if you find that your office hours are just too long and inflexible as per your individual needs then you should go right ahead and quit even if you haven’t got another job at hand. If you know for a fact that the job you are presently doing is not helping you grow as a person or worker or not tapping into the skills which you have, then it is better that you quit. You must take up only that job which challenges you and makes you feel proud of yourself. Previously even if one member of the family had a good job the family could live a comfortable life. However, nowadays this is not enough. It takes at least two earning members to ensure that the family can live well. This having been said there are some unavoidable circumstances under which it is acceptable to quit your job without some other offer in hand. No matter how bad the present global economic situation is, if you are good hard working individuals with unique skills, there will surely be a company which will be willing to hire you despite all odds.